1. 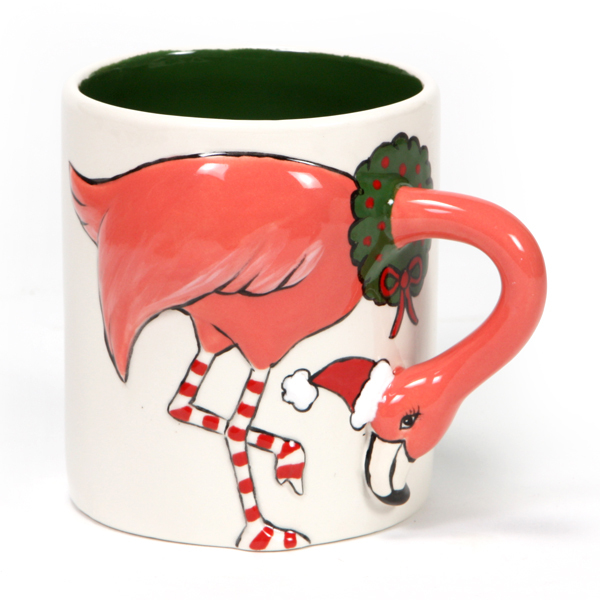 Using a felt tip pen, sketch a Santa hat going from the flamingo's head to the body of the mug. Then sketch a wreath around the base of the flamingo's neck. Finally, make horizontal stripes on the flamingo's legs. 2. Using a Liner brush and SC-89 Cutie Pie Coral, apply three coats of glaze to the body of the flamingo. Allow glaze to dry between coats. Using the Liner and SC-16 Cotton Tail to make highlights at the tips of the wings. 4. Using the Liner and SC-86 Old Lace, apply three coats of glaze to the beak. Allow glaze to dry between coats. 5. Using the Liner and SC-36 Irish Luck, apply three coats of glaze to the wreath. Use a Fan Brush to apply three coats of glaze to the inside of the mug. Allow glaze to dry between coats. 6. Using a Detail Liner brush and SC-74 Hot Tamale, apply glaze to the Santa hat. Using the same brush and glaze, apply dots to the wreath. Then make a bow at the bottom of the wreath and stripes on the legs. Apply a total of three coats to all areas, allowing glaze to dry between coats. 7. Using SC-15 Tuxedo and a Detail Liner, make outlines around the flamingo, wreath and hat. Make an outline of the fur at the top and bottom of the hat. 8. Take a AC220 1 oz Writer Bottle and add SG-302 Snowfall until it is halfway full. You might need to use the Liner to help push the SG-302 Snowfall into the Bottle. Screw on the Detailer Tip and cut off the very top so that there is a small hole. Squeeze out dots of SG-302 Snowfall in the fur outlines at the top and bottom of the hat. 9. Use the Soft Fan brush to apply two coats of Clear Brushing Glaze to the mug or dip into Clear Dipping Glaze. 10. Fire to cone 06.